Julia and Antonio’s sweet wedding ceremony took place in the Foyer of the Grand Ballroom of the beautiful Vinoy Renaissance in downtown St. Petersburg in late September. Julia looked amazing as she was escorted down the aisle by her father to join Antonio at the head of the aisle. There, in front of their family and friends, the couple shared their vows, exchanged rings, and were pronounced husband and wife by Rev. Rick Lackore of Sensational Ceremonies. DJ Services provided by Eric with Grant Hemond and Associates; Florals and Décor provided by Events in Bloom; Venue Coordination provided by Alexandra and the staff at the Vinoy, and Event Coordination provided by Erikka with Showorks Events. 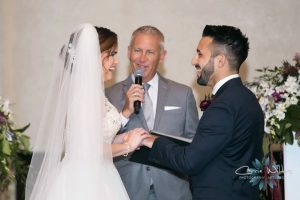 Special thanks to Carrie and Linda with Carrie Wildes Photography for providing this beautiful photo as Julia shared her ring vows with Antonio. Congratulations to the new Mr. and Mrs. Antonio Verilo!